The 248 year-old French lighting, tableware, and gift manufacturer created home illumination devices way before Thomas Edison invented the light bulb. They still make crystal candelabras and candleholders out of their factory in the village of Baccarat in the French region of Vosges. Harcourt, a barware line, has been a best-seller for over 170 years. 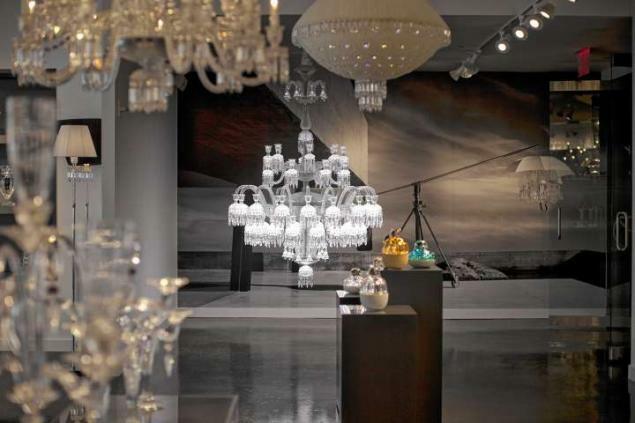 The Solstice Comete, a $170,000 chandelier, is surrounded by other crystal chandeliers at the new Baccarat showroom at the D+D Building. The big ticket items are the chandeliers. The new showroom is full of them. Furnished with raw concrete floors and exposed pipes in the ceiling, the space has black chandeliers designed by Philippe Starck for $82,400, more petitechandeliers for $47,900, crystal caviar and vodka sets for $5,900, and the best-selling "Our Fire" candlestick for $795. Looking at the 10th floor loft-like room at night from across the street would be like seeing into a cloud full of diamonds. All of the company's glass is hand-crafted, including the $170,000 Solstice Comete chandelier, which anchors the recently-opened showroom. From underneath, it looks like a spaceship made of ice. Baccarat reports selling one double the size to a private collector in Germany. The cost of that piece here would be well over $225,000. 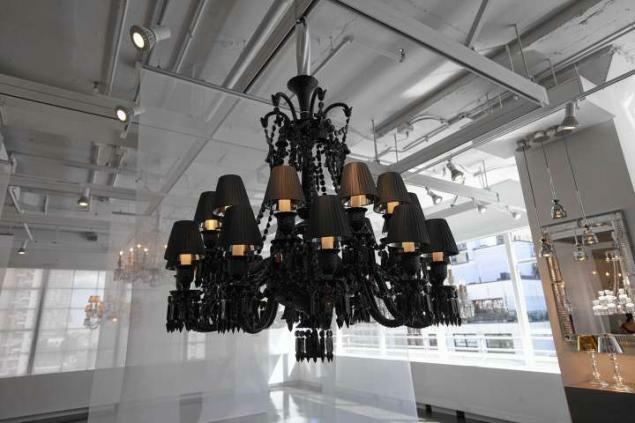 Baccarat works with internationally known designers like Philippe Starck, who designed this all-black crystal chandelier. "We have fifth generation glass cutters working in our factory," says company marketing director Jaime Jimenez. "Marry that with new technology and LED lighting and you have something that no one can say is not beautiful. That's what Baccarat stands for, exceptional craftsmanship and pure beauty." Baccarat is now owned by real estate financier Barry Sternlicht's Starwood Capital. Sternlicht, who has plans to open an uber-luxurious Baccarat hotel on 53rd St. across from the Modern Museum of Art in 2014, founded Starwood Hotels & Resorts and created the W Hotel brand. 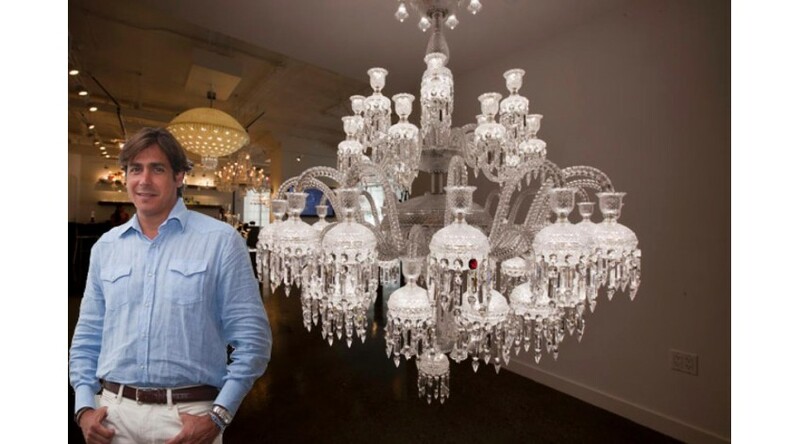 Baccarat places one red piece of crystal in each chandelier as its signature.